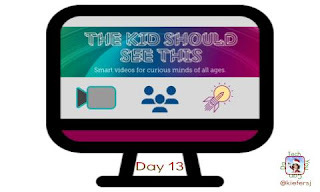 The Kid Should See This connects busy teachers and parents to a growing library of smart, short, & super-cool, “not-made-for-kids, but perfect for them” videos that can be watched in the classroom or together at home. Enjoy 8-12 new vids each week, and search 4,000+ videos in the archives, curated by me, Rion Nakaya, with help from my 8 & 10 year olds. ..... and SO many more!!! Please click HERE for the collection of all 15 resources.